Our next annual community concert will be on Saturday, February 9, 2019, at 7:30 p.m. at the Pabst Theater, 144 E. Wells Street. Our concert tickets are always free and everyone is welcome to attend. 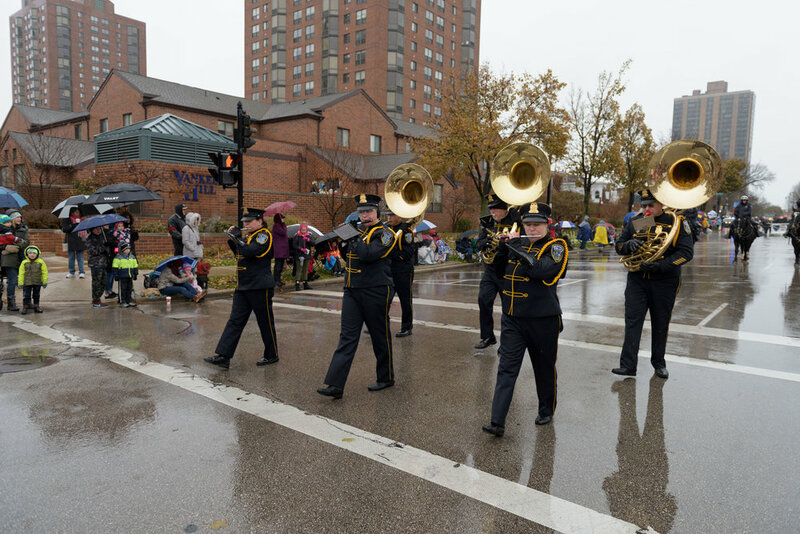 For Milwaukee Police Band Performances in 2017, please see below as well as our memories page from 2015-2017. For a list of our future performances, please check out our Schedule located on our home page. 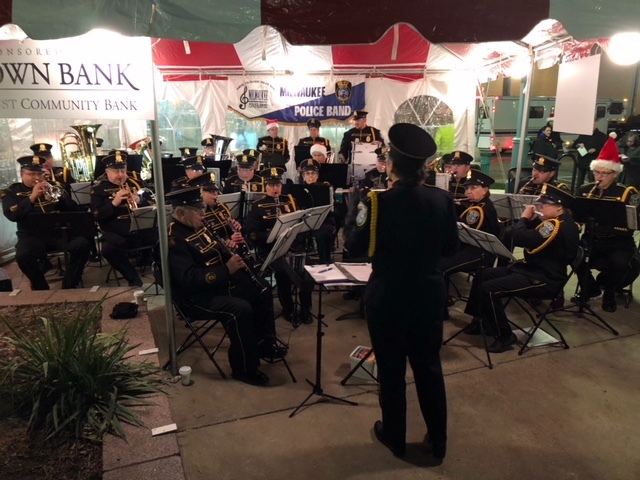 The Milwaukee Police Band performed at the Third Ward Christmas Tree Lighting ceremony on Friday, December 1, 2017 in front of hundreds of people enjoying the unseasonably warm weather in Milwaukee. 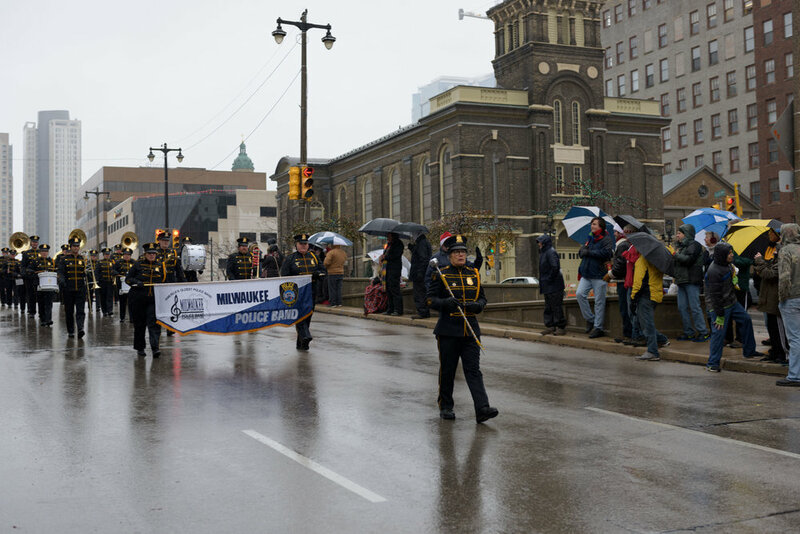 The Milwaukee Police Band marching in the Holiday Parade in downtown Milwaukee on Saturday, November 18, 2017 in the rain and snow. The show must go on! The Milwaukee Police Band performing at the recruit graduation at the Police Academy on Thursday, November 16, 2017. Retired Police Officer Jim Hutchinson singing "Moon River". 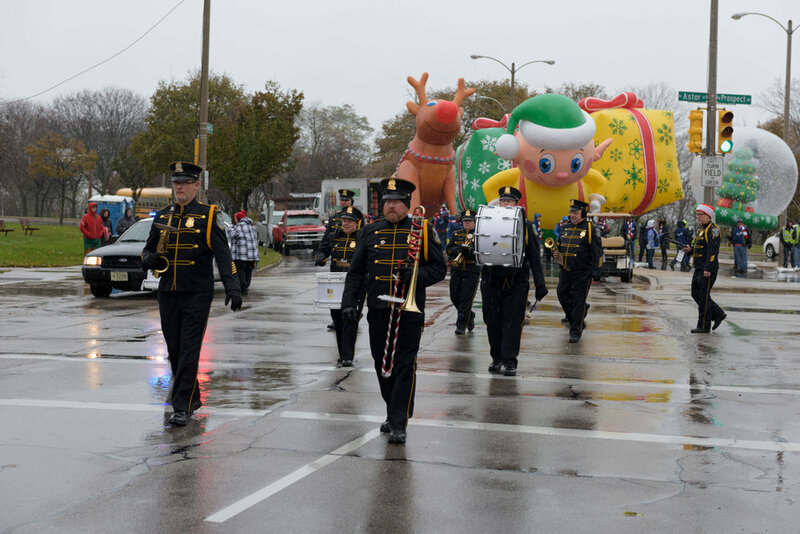 Milwaukee Police Band Musicians on Flute; Sharon Ehlert, Michelle Griffith and Vicki Novotny. Alto Sax is Retired I.D. Tech David Granica. The band performed at the Officers Mass of Blessing on Tuesday, May 23, 2017 at the Basilica of St. Josaphat honoring law enforcement officers serving in our community. The Milwaukee Police Band performed prior to the Greater Milwaukee Law Enforcement Memorial on Wednesday, May 10, 2017 at the Wisconsin Center, 400 W. Wisconsin Avenue, indoors. On Tuesday, May 9, 2017 the Milwaukee Police Band performed at the Academy for the departments Merit Award Ceremony. On Saturday, May 6, 2017 the band performed for the Opening Ceremonies of the Special Olympics, Region 8 at the Muskego High School. On Friday, April 7, 2017 at 12 Noon, members of the Milwaukee Police Band traveled to Madison, Wisconsin to perform during the Crime Victims' Rights Ceremony in the Capitol Rotunda in recognition of National Crime Victim Rights Week. 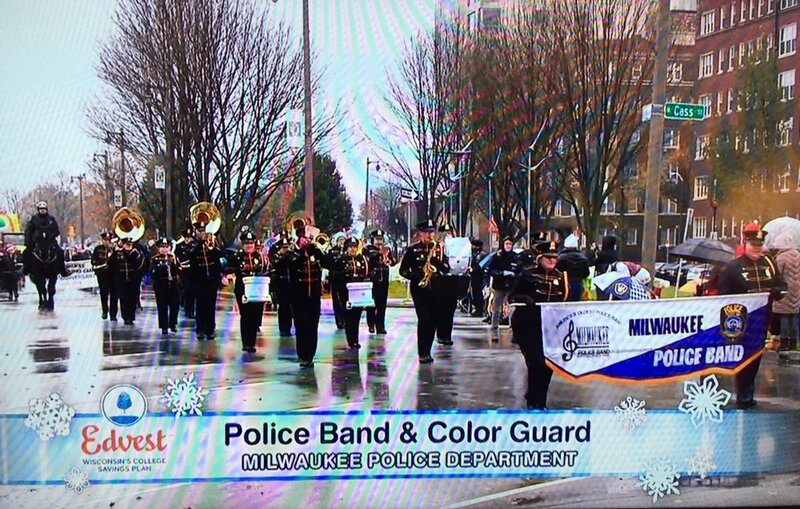 The Milwaukee Police Band was chosen to participate in the taping of a Colders commercial at the Police Academy on March 22, 2017. Watch for us in the future on television! The Milwaukee Police Band performed at the Milwaukee Police Department Recruit Graduation at the Academy on Thursday, February 16, 2017. During the Recruit Graduation, the band members are standing up in support of the newly graduated police officers from the Academy. The Milwaukee Police Band "Bluecoats" performing at the Neeskara Elementary School on Wednesday, February 15, 2017 at 1601 N. Hawley Road. The students are performing on percussion instruments with the band. The Neeskara Elementary students are dancing with the band to the song Uptown Funk. Here, the Neeskara Elementary school teachers are dancing to some rock and roll to the delight of their students. On Saturday, February 4, 2017, the Milwaukee Police Band performed their annual free concert for the community at the Pabst Theater. Please see our annual concert page under the performances tab for more photos. On Wednesday, February 1, 2017 the Milwaukee Police Band performed for the Crime Prevention Awards at the Wisconsin Club at 900 W. Wisconsin Avenue. On Wednesday, January 18, 2017 the Milwaukee Police Band "Bluecoats" performed at the St. Matthias Parish School at 9300 W. Beloit Road. This performance is part of our elementary school concert series.